Everything DiSC® Workplace ™ helps build better relationships - one relationship at a time. The Everything DiSC® Workplace ™ Facilitation Kit is designed to be used with the Everything DiSC® Workplace ™ Profile. Three 90-minute modules, fully-scripted facilitation with engaging activities and workplace-focused video. Also includes 30-minute optional people-reading module. Switch out video clips. Modify the PowerPoint, Leader's Guide, and handouts. Add or delete sections to fit any timeframe. Participants learn how to identify others' DiSC® styles based on behavioral cues. Introduces the DiSC® model and describes the four styles. A game show host introduces four coworkers of different DiSC® styles and interviews them on their instinctive reactions to each other. Interviews describe the challenges and strategies for working with each DiSC® style. One actor models the various DiSC® styles. Everything DiSC® Comparison Reports are follow-up reports that can be created for any two participants to illustrate their similarities and differences. The research-validated 11-page Everything DiSC® Comparison Report helps to build better relationships and makes training stick. And participants get unlimited access - at no additional charge. 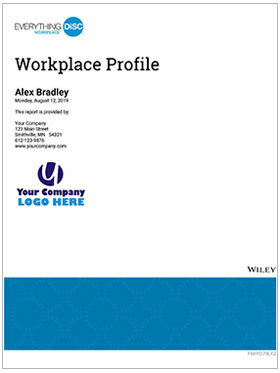 The Comparison Report works for all Everything DiSC® Application Library programs including Management and Workplace. Facilitation, video, PowerPoint®, and handouts are delivered on a USB drive. The Everything DiSC® Workplace ™ Profile helps build better relationships - one relationship at a time. The Everything DiSC® Workplace ™ Profile can be used with everyone in an organization, regardless of title or role, to improve the quality of the workplace. Participants understand and appreciate the styles of the people they work with, and the result is more effective and productive working relationships. The Everything DiSC® Workplace ™ Profile is designed to be used with the Everything DiSC® Workplace ™ Facilitation Materials. Everything DiSC® Workplace™ Guides are job aids that support the Everything DiSC Workplace training. Participants create their own Everything DiSC Map, indicating their DiSC style and list specific ways they prefer to be communicated with. Participants can display it in their workplace to create effective, productive working relationships. 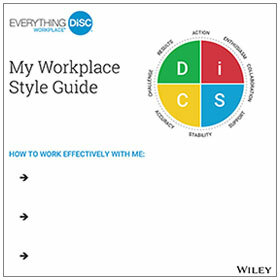 The Everything DiSC® Workplace™ Guides are not meant to be used as a standalone product. Contact us about facilitating this program for your organization when you contact us. Everything DiSC Workplace® is a registered trademark of Inscape Publishing.